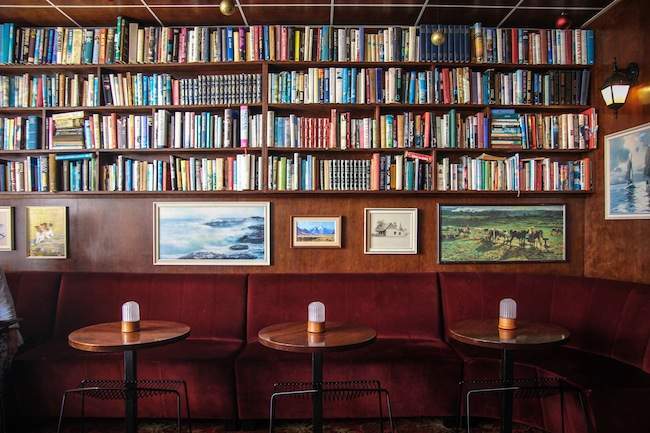 A lauded Friday night destination hidden away above the raucous debauchery that is Courtenay Place, Library Bar, with its book-lined walls, intimate booths and dim lighting is the perfect place for an evening rendezvous. So popular has Library Bar become that it is not unusual to see a queue winding its way down the street outside, as punters patiently wait for their turn to indulge. Once in the inconspicuous door, one might feel for a moment that they’ve made a wrong turn; the staircase is completely unadorned and wouldn’t be out of place in an old office building. But, at the top of those stairs lies a doorway to luxury. Their cocktails (and their two-for-one cocktail deals) are second to none. Hands down some of the best in the city; the Library bartenders know their way around an alcohol cabinet (try the Peach Mule ($14) you won’t be disappointed, I promise). They also serve up some pretty impressive fare. Alongside their extensive 27-strong tapas menu, their dessert list (and their two-for-one dessert deals) including everything from creme brulee ($13) to warm chocolate fondant ($17) to the peanut, caramel and popped corn ice cream sundae ($15) is highly impressive (and delicious), and makes choosing just one option almost too hard. But, this multi-talented establishment doesn’t stop there. What I was interested in (and highly impressed by) were its hot chocolates. Not satisfied with just the standard chocolate drop, Library bar has been innovative in its hot choc flavourings. Options include the white chocolate chai latte ($8) and the rum hot chocolate ($13), but my preference lay with the gingerbread hot chocolate ($8). Accompanied by a gingery biscuit, this warm bevvy produces thoughts of roaring fires, hand-knitted rugs and general blissful comfort. Quite simply, cosiness in a cup.